Now localizable and accessible from a variety of browsers, the Pega 7 Designer Studio provides a rich developer experience that is optimized for ease of use. A complete redesign puts intuitive tools at the forefront to simplify the design experience and enable you to quickly build enterprise scale applications. This article gives a tour of the Designer Studio, highlighting its major functions and new features. The Pega 7 Designer Studio clearly presents the required information and tools to perform work in any context. Primary user actions have been promoted to the top level menus for greater visibility. Explorer navigation is streamlined with greater control over configuration and display of data. Developer tools are centrally located and display based on role. Complexity and visual distractions have been eliminated to provide a modernized yet cohesive experience. The Header located at the top of the Designer Studio gives global access to the application by way of landing pages, wizards and tools. Here is where you can create cases, search for records and launch secondary portals. Click on the desired menu name or icon to view available options. The Explorer Panel houses each of the Designer Studio Explorers, allowing simple navigation between operator, application and system level records. Click on a name or icon to load the desired Explorer in the Explorer Panel. The Work Area is the largest component of the Designer Studio, providing a specific context for the record, report, wizard, work or landing page that is currently in focus. Include tabs as a navigation option for your Work Area to manage which items are open on your own, or turn them off and allow Pega 7 to take care of the rest. The Developer Toolbar located in the footer of the Designer Studio helps power users debug applications, tune performance and quickly analyze the composition of UI components. Click the Pega 7 icon to load the Home Page in your Work Area. The Home Page displays guardrail warnings for your application and facilitates task assignments between you and operators in your associated access groups. Click the Designer Studio logo to access landing pages, wizards and tools to build your application. Although not an entirely new feature in Pega 7, the landing page structure has been reorganized and enhanced to better align with application development needs. The Landing Page menu is grouped by functionality and presented in tiers. Navigation is from left to right as illustrated below. The first level Application is a general landing page category. The second level Structure is a group of landing pages available within the Application category. The third level Other Application is a specific landing page available within the Structure group. Make a selection in the second level of the menu to load a tabbed group of landing pages in your Work Area. Selections made in the third level of the menu also load a group; this time with a specific landing page tab in focus. Landing pages generally include the following action buttons: Refresh updates your page with the latest system data; Help launches the PRPC help system article for the landing page; Close removes the landing page from your Work Area. Click on the Application menu to display the available actions you may take on your current application. Open Overview — open the Application Overview landing page to review DCO-related information about your application. You can also use this page to document your application or prepare it for migration to another system. 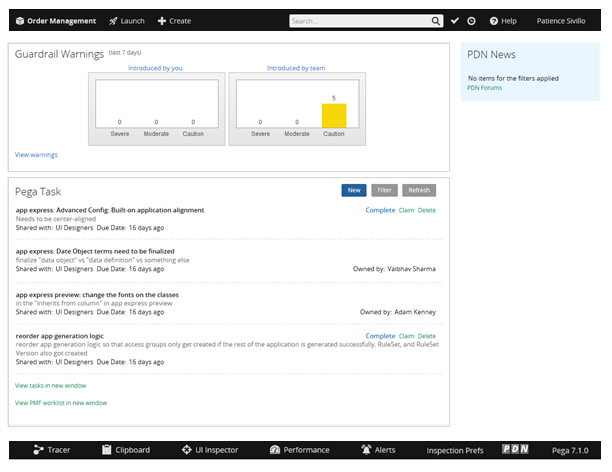 For more information, see Managing your application profile from the Application Overview landing page. Open Application — open the current application's Application rule in your Work Area. Open Application Skin — open the skin rule defined for your application in the Work Area. Switch Application — change context to another application. This menu is populated by the list of alternate access groups found on your Operator ID form. Switch Work Pool — change your current work pool and update the class hierarchy shown in the Application Explorer. This menu is populated by the list of work pools found on your Access Group form. Click Launch to open another portal such as Case Manager or Case Worker. This menu is populated from the list of secondary portals defined on your Access Group form. Click Create to run flows that create new instances of work. 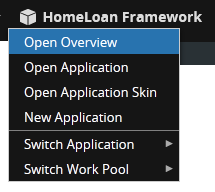 This menu displays all starter flows present in your current application layer as well as those that are inherited from the application's built-on application. 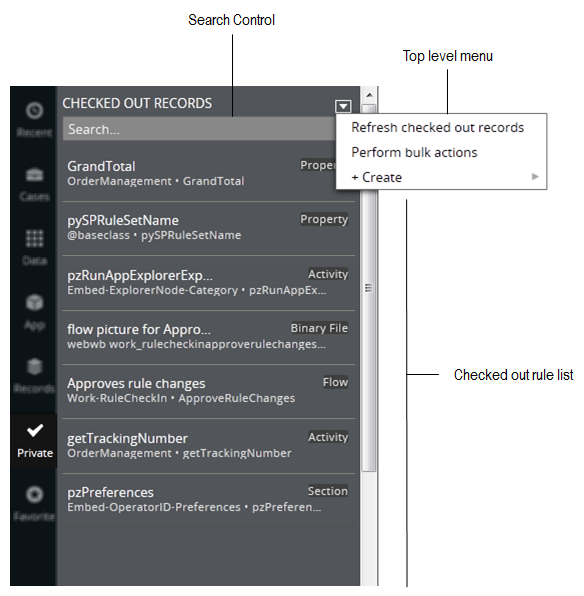 The search control provides full-text search against rules, data objects and content in the PRPC help system. Enter your desired search term in the input field and hit enter or click on the magnifying glass icon to review the list of matching results. Results can be narrowed by rule type or class. Click to review a list of rules you have checked out. Clicking this icon also gives you access to the Bulk Actions feature; use this capability to perform rule management actions (check-in, delete checkout) on multiple records at a time. Click to load the contents of the Recent Explorer in an easily dismissed overlay. This allows you to view and open your most recently accessed items without having to change context in the Explorer Panel. Click Help to gain access to the PRPC Help System and other relevant product information. Pega 7 Help — launch the PRPC help system to search help topics and learn about specific rules, tools and landing pages. Pega Discovery Network — open Pega Discovery Network (PDN) in a new window to review articles, forums and installation guides for all of our Pega products. What's New — review the features and concepts introduced in Pega 7. Pega Support — get information and guidance on how to request support or report issues for any of our Pega products. APIs — get signature definitions of the Application Programming Interfaces (APIs) used by the Engine and Case Management. About Pega 7 — review system level specifications for your installation of Pega 7. Use the Operator menu to review your profile, set preferences, add or edit favorite records or log off the system. The label for this menu is populated by the Full Name field defined on your Operator ID form. Profile — view configuration for you operator such as RuleSet stack, access group and locale. Some fields are editable such as availability and current password. Preferences — view and edit developer preferences to be used in the Designer Studio such as enabling tabs in the Work Area and specifying a PMF User ID. Operator — open your Operator ID form in the Work Area. Access Group — open your current Access Group form in the Work Area. My Favorites — view and edit the list of favorite records visible to your operator and other operators in your access group. Log Off — log out of the system and return to the Pega 7 login page. Explorers organize similar actions and tools to keep users focused and efficient. Each Explorer gives a specific view into an application’s configuration and composition. Toggle between Explorers by clicking on the icon or name in the Explorer Panel. Only one Explorer may be in focus at a time but we will maintain the state of each explorer as you navigate between them. Details on each of the seven Explorers supported in Pega 7 can be found below. Identified by Recent in the Explorer Panel, the Recent Explorer can easily view, open or search the last 20 items you have accessed in the Work Area of the Designer Studio. They include records, landing pages, reports, wizards, forms, and other work. As you use the Designer Studio, the Recent Explorer automatically updates to mimic the order of your actions. The state of this Explorer is maintained even when you logout; your next session will pick up immediately where you left off. Search Control — type any string in this field to filter the contents of the Explorer. Matches are returned by examining the record name and its key parts. Clear this field to return to the full Explorer content. Top level menu — use this menu for additional filter options and to quickly create new records. Active Item List — click on an item to open it in the Work Area. Checked out items are denoted with the checkmark icon. Deleted items will open their last history snap shot in the Work Area for easy review of changes or restoring a prior version. Identified by Cases in the Explorer Panel, the Cases Explorer helps you quickly review and update your application’s case type hierarchy without losing context. Click on any case type name to load the Case Designer in the Work Area. Use contextual menu items to add cases in a specific location in the hierarchy or promote existing classes as case types. The Cases Explorer uses a tree structure similar to the Application Explorer; navigate it by using the expand and collapse icons. this new Explorer replaces functionality formerly located in the Case Designer landing page. View the Case Management Gallery landing page. 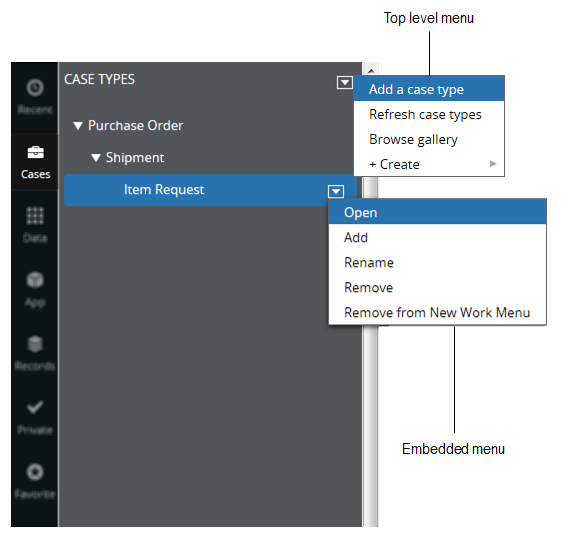 Remove the case from the Create Case menu on the user portal. For more information on case types, see Introduction to Stage-based Case Management in Pega 7. Identified by Data in the Explorer Panel, the Data Explorer simplifies the creation and modification of data object types and their associated data pages (formerly known as "declare pages"). Filtering options help keep Explorer content focused while top level menus give quick access to frequently used actions. This Explorer also gives a quick overview of which data object types have defined data pages and how often they are referenced. Navigate this Explorer by using the expand and collapse icons. For more information, see Data Management: What's New in Pega 7. Search Control – type any string in this field to filter the contents of the Explorer. Matches are returned by examining the short description of the data object type. Clear this field to return to the full Explorer content. 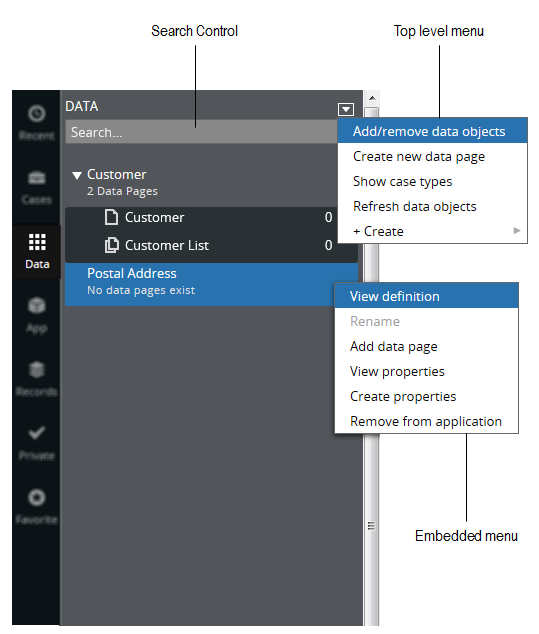 Top level menu – use this menu to add or remove data object types, create data pages, filter out case types from this Explorer, and create new rules. 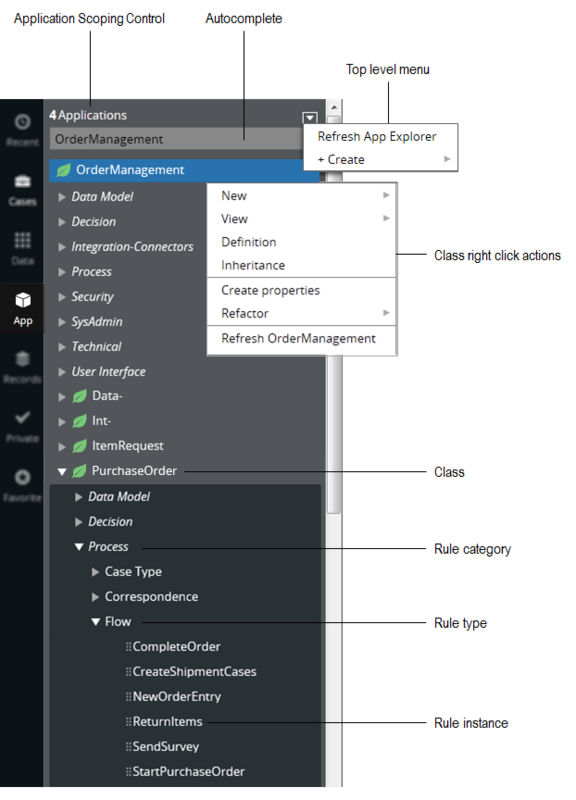 Identified by App in the Explorer Panel, the Application Explorer gives a hierarchical view of the rules in your application stack. Interactive controls help isolate specific layers and classes while right click actions display only those options that are pertinent to your position in the tree structure. Navigate this Explorer by using the expand and collapse icons. Drag and drop different elements from this Explorer into UI rules like Sections and Harnesses. Application Scoping Control — use this control to select which applications are included in the Explorer.This feature is useful when you want to focus on rules in a particular layer of the RuleSet stack. Autocomplete — use this field to select the root class of the tree structure in the Explorer. This feature is useful when you want to see rules with a particular Applies To class. A blank value in this field displays your last 10 selected class names or “Best Bets”. Enter “@baseclass” to see all the top level classes and class groups defined in your access group. Right click actions — these are enabled at the class, category, rule type and instance level. Common actions include creating new rules and viewing instances of a particular rule type. Additional options are available based on where you initiated the click. For example classes can be refactored or renamed while only properties can be optimized for reporting. 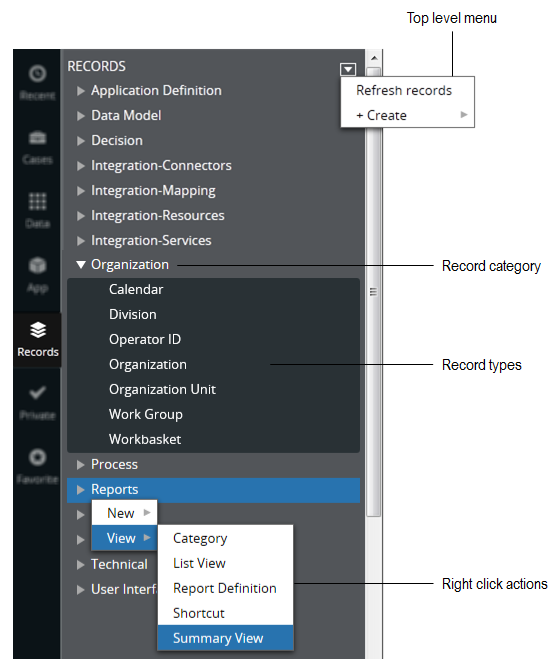 Identified by Records in the Explorer Panel, the Record Explorer gives a flat view of all rules and data instances in your system organized by record category and type. Use this Explorer when you need to find a record of a specific type but do not necessarily know the Applies To class, or are looking for records without an Applies To class such as Operators or Controls. Navigate this Explorer by using the expand and collapse icons. Click a record type to view a list of its instances in the Work Area. Top level menu – use this menu to refresh Explorer content or create records in a context free manner. Right click actions — create or view records in a context sensitive manner. If initiated from the record category level, you may create or view records of all types within the category. If initiated from the record type level, you may only create or view records of that specific type. Identified by Private in the Explorer Panel, the Private Explorer displays all records that are currently checked out by your operator. Similar to the Recent Explorer, items displayed here are order sensitive and automatically update as you configure your application (check out, check in) in the Designer Studio. Records checked out using the Private Edit, Checkout to branch and Checkout options display here. Use this Explorer to view items or use the Bulk Actions feature to perform record management actions on multiple records at once. Search control – type any string in this field to filter the contents of the Explorer. Matches are returned by examining the record name and its key parts. Clear this field to return to the full Explorer content. 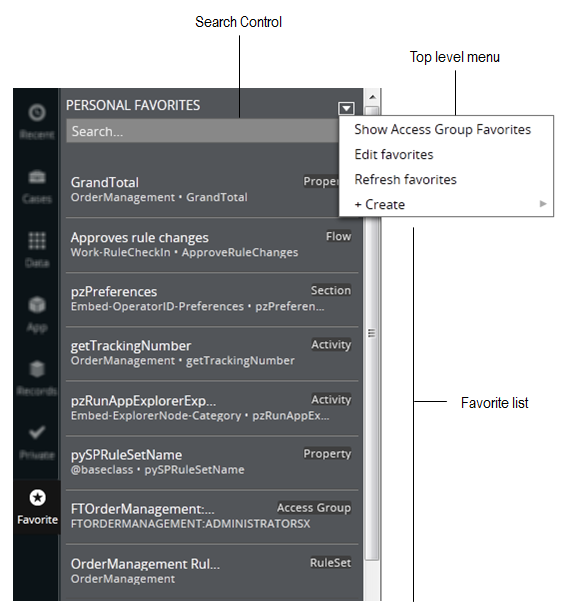 Top level menu – use this menu to access the Bulk Actions feature, create new records or refresh Explorer content. Checked out rule list – click any item in the list to open it in your Work Area. Identified by Favorite in the Explorer Panel, this explorer can easily view, edit or open your favorite records. A rule or data instance can be added as a favorite using the Actions > Add to favorites menu option in the rule form header. Favorites are organized into two categories: Personal and Access Group. Access Group favorites are typically used to delegate records such as decision tables. Personal favorites are a great way to boost productivity by making it easy to find important records you often refer to. Search control – type any string in this field to filter the contents of the Explorer. Matches are returned by examining the rule name and its key parts. Clear this field to return to the full Explorer content. Top level menu – use this menu to toggle between categories of favorites, refresh the current content, edit existing favorites or create new records. Favorite list – click any item in the list to open it in your Work Area. Right click options can be used to delete a favorite or run the record (when applicable). The Designer Studio Developer Toolbar provides quick access to tools that can greatly assist in debugging an application, analyzing performance and understanding how an application is built. Click Tracer to start the Tracer in a new window. Tracer is faster than ever, fully cross-browser and supports several new event types. It traces your application execution at runtime giving you powerful debugging utilities including step-by-step execution, breakpoints, watch variables and customizable event types. Click Clipboard to launch the Clipboard tool in a new window. Now cross browser and localizable, this tool has been reorganized to improve navigation, thread selection and editing property values (when appropriate). Use this tool to view contents of pages stored in temporary memory for your requestor. Click UI Inspector to enable the UI Inspector tool. This feature lets you review the structure of user interface elements in your application such as containers, panels, harnesses, layouts, sections, flow actions and cells. Hover over any element in the Designer Studio to view a live overlay detailing the element’s type and rule hierarchy (containing UI rule structure). Use the provided links to open individual rules in the Work Area for closer inspection. Click the UI Inspector icon a second time to disable it. For more information see Discover your UI using the UI Inspector. Click Performance to open the Performance Analyzer tool (PAL) in a new window. Use this tool to collect system resource usage statistics and gain access to finer grain performance tools such as DB Tracer and Profiler. PAL, like the other tools in the Developer Toolbar is now fully cross-browser. Click Alerts to view the Alert logs in a human readable format. Alerts are organized into two categories: Performance and Security. You can toggle between Performance and Security related alerts that were generated on your server node. You can also filter alerts that were generated by the current requestor session or all sessions. Declaratives — properties that are computed by a Declare Expression rule are denoted in the Designer Studio with small red D after you refresh the portal. Field Values — text labels for which field value rules are defined are denoted in the Designer Studio with a globe icon after you refresh the portal. Click the PDN link to open Pega Discovery Network site in a separate window. The Work Area of the Designer Studio provides the main workspace for users as they open, review and edit items such as rules, reports, landing pages or wizards. Although the Work Area itself is not new for Pega 7, enhancements have been made to the layout, default content and navigation options to provide better usability and flow. New operators will have include tabs as a navigation aid in the Work Area by default. This means that as you access items in the Designer Studio, they will be loaded in the Work Area as an individual tab. Up to 16 items can be open at once before you are prompted that the limit has been reached. Tabs remain open even when you switch applications or work groups. You can manage which items are open at any point in time. To remove a tab, click the close icon located next to the tab name. Alternatively, use the Close button located in the rule form header. Designer Studio will not close any items in your Work Area that have unsaved changes without warning. You are prompted to commit your changes or manually close the item using the tab’s close icon. To allow Pega 7 to manage your open items for you, use the Operator menu to access operator preferences. Disable the Include Tabs option and save. You must log out of the system for the Work Area to reload with this new preference. Now when you access an item in the Designer Studio, it replaces the full content of the Work Area. Only one item is displayed at a time and Pega will manage the open document list automatically for you behind the scenes. Use the Close button to remove the item from your Work Area when finished. With or without tabs, Pega will return you to the most recently accessed item when you click close. Use the Recent Explorer to review the last 30 items you opened in the Work Area. the operator preference for Work Area tabs applies only to harness based rules. Form based rules will always open in a new window and must be closed manually. The straightforward design of Pega 7 form headers makes a clear distinction between information describing a record and the specific actions that can be performed on a record. Important metadata such as short description, availability and status are now editable via interactive controls on the form itself. Actions are configured to smartly display only the options that are relevant to record its current state (i.e. locked, checked in, checked out) and make the primary action clear. The actions and menus have been organized to put information at your fingertips without having to stray away from the Work Area. Details – Use this area to review the key parts of a record or edit important attributes such as circumstance, availability, status, short description or associated RuleSet. Actions – Use this area to perform record management actions (check out, check in, delete, copy) and access more advanced features such as Trace Open record and Run record. Warnings – Warnings are presented by severity and do not prevent a record from being saved. An indication of the warning type and how it can be resolved will be provided in this area. Users may use the Add Justification link to indicate this warning has been reviewed and approved. Errors - Errors are presented by the order in which they are found during validation. A description of the issue and the invalid value or configuration will be provided. Users must resolve all errors before the record will save successfully. For more information, see About Pega 7 forms. The Pega 7 Home Page has been streamlined for simplicity. Open this page to quickly see guardrail warnings in your application without having to drill down into landing pages. Use the new Pega Task feature to keep track of your personal “to do” list or share tasks with others. Check out PDN News to see what new content is available in the Designer Studio RSS feed without logging directly into PDN. Although the Home Page is loaded into your Work Area by default upon log in, it will not display as an entry in the Recent Explorer item list. 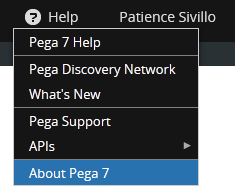 Use the Pega 7 icon located in the Designer Studio header when you need to get back to the Home Page. 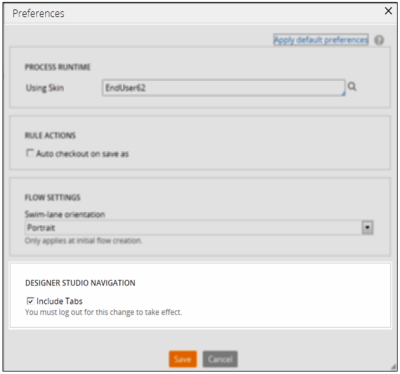 Pega Task – double click to edit a task. Use the filter button to quickly see which tasks are private or see only tasks associated with specific access group. PDN News – read content from the last seven days as displayed or click on an article to view it directly in the PDN. 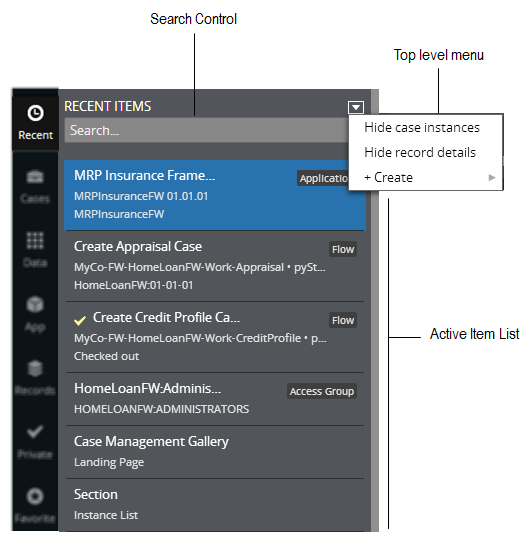 if your application is integrated with PMF, the “View PMF worklist in a new window” link displays at the bottom of Pega Task.